The men’s and women’s swimming and diving teams competed in their first intercollegiate dual meet of this season against the University of North Carolina (UNC)-Wilmington with a win for the women’s team and a loss for the men’s team. The final standings were 152-142 for the men’s team and 157-131 for the women’s team. Combined, both teams won 23 of 32 events, 15 out of 16 of which were won by the women’s team. The women’s team locked in wins in the 200-yard freestyle, the 500-yard freestyle and the 50-yard freestyle by freshman Ming Ong, the 100-yard freestyle and 100-yard backstroke by sophomore Claire Liu and a 200-medley relay victory by Liu, freshman Cindy Cheng and sophomores Annelise Kowalsky and Kristine Rosenberg. Liu, Ong, freshman Julia Wawer and senior Nancy Larson won the 200-yard freestyle relay race. Senior and Co-Captain McKenna Newsum-Schoenberg won 1,000-yard freestyle and 200-yard butterfly. Other individual event victors included Kowalsky, junior Ellie Thompson, sophomore Marcela Sanchez-Aizcorbe and freshman Mara Rosenstock. She added that the team proved they could prevail. For the men’s team, junior Andrew Wilson dominated the 100 and 200-yard breaststroke events as well as the 200-yard individual medley. Like the women’s team, the men’s senior and Co-Captain Hayden Baker won the 200-yard butterfly, and his brother College sophomore Christian Baker claimed the 200 and 500-yard freestyle titles. Other victors for the men’s team included freshmen Henry Copses and Alexander Hardwick in the 1,000 and 100-yard freestyle, respectively. UNC-Wilmington presented a sizeable challenge as a Division I opponent, especially for the men’s team because they did not have any divers competing, according to Head Coach Jon Howell. Because of the lack of divers, the men’s team started off with a 32-point deficit, 22 of which they were able to make up. “It’s hard to compete without any male divers, but we put up a great fight, making up 22 points on the swimming side of things,” Baker said. However, the team fell short 10 points despite their success in the swimming competitions. “They had to really step up, and the men’s team did,” Newsum-Schoenberg said. As for the women’s team, they were successful on both sides of competition. “The women were fairly dominant in the meet,” Howell said, commenting on the fact that they only lost one event. Additionally, the weekend brought in a large crowd due to Alumni and Family Weekend. “It was a fun weekend across the board,” Howell said. The atmosphere also affected the team members. “Having family and alumni in the stands was icing on the cake,” Newsum-Schoenberg said. The competition also marked the first meet for members of the team who are new this season. “Our freshmen handled their first meet well,” Baker said. While the opportunity to compete against a Division I team was good experience for Emory’s team, Howell said his main objective is preparing for the team’s national championships. “Our objective right now is to get a little better every week and I think we definitely accomplished that from where we were a week ago,” Howell concluded. 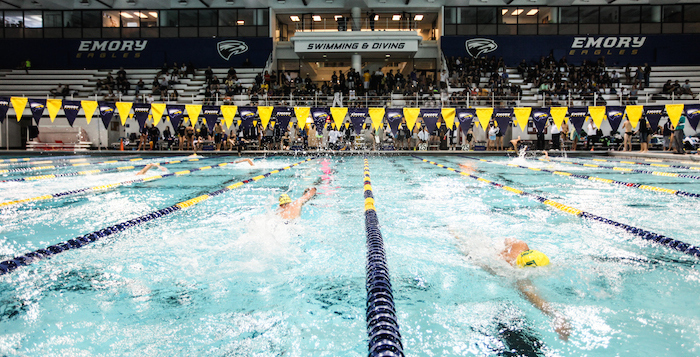 The Emory swimming and diving teams’ next competition will be another dual meet in Birmingham, Ala. against Birmingham-Southern College on Saturday, Nov. 1.